The RC-10 Control and Communciations cubicle provides directional overcurrent, earth fault and sensitive earth fault relay, auto reclosing relay, instantaneous metering, event log, load profile, remote terminal unit and much more for remote control in a single package. The operator control panel is provided with a large backlit LCD display and keypad to provide fast navigation and local control. The panel menus are presented in descriptive text which provides ease of use for operators and reduces the learning curve. The operator panel module which provides the Human Machine Interface (HMI). The Switch Interface Module (SIM) provides power management, battery charging and incorporates the capacitors that provide the tripping and closing energy to the OSM tank. The Relay module includes the main microprocessor and provides DSP functionality. There is space provided inside the control cubicle to install any communications equipment to be connected to the in built RTU or I/O module. 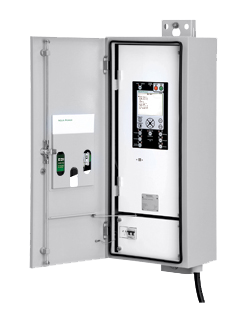 The equipment has been designed for the RC10 control cubicle to operate over a temperature range of -40 to +55°C inside the IP66 sealed enclosure. The cubicle is constructed from of powder coated stainless steel for a long maintenance free lifetime. The roof features a ceramic based insulating coating that provides a 16°C reduction in internal temperature when the cubicle is exposed to 1.1kW of solar radiation. The entry point for the control cable is housed within a vandal-proof enclosure and the cubicle door has a three point handle locking mechanism making it extremely difficult to break into. The battery provides power while there is loss of auxiliary supply and allows the shutdown of the device in an orderly fashion if there is a prolonged loss of AC. The user can carry out a battery test manually or remotely at a regular configurable time interval.